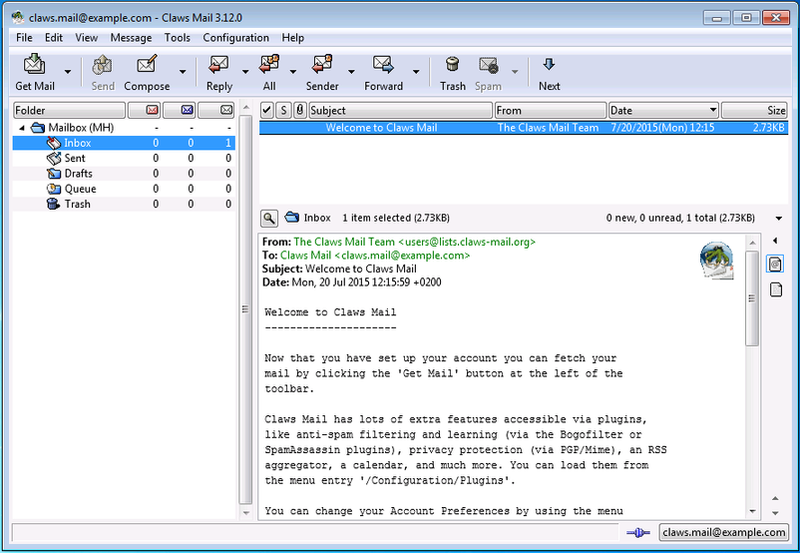 Claws Mail is ported to Windows. You can download the latest available version from here. AddressKeeper : Allows automatically adding recipients' email addresses to the addressbook when writing or replying to emails. AttRemover : Allows removing attachments from received emails. AttachWarner : Warns when the user composes a message mentioning an attachment in the message body without attaching any files to the message. BSFilter : A bayesian anti-spam plugin. FetchInfo : Adds information about reception time, account, etc in headers. Fancy : Displays HTML emails. Libravatar : Displays libravatar/gravatar profiles' images or a dynamically generated or predefined alternative. Libravatar federated user domains are also supported. ManageSieve : This plugin lets you manage Sieve filters on servers that support the ManageSieve protocol. Notification : Provides various ways to notify the user of new and unread email. PGP and S/Mime plugins : Enables digital signature and encryption handling. RSSyl : Allows you to read your favourite newsfeeds in Claws. RSS 1.0, 2.0 and Atom feeds are currently supported. TNEF Parser : Enables reading application/ms-tnef attachments. vCalendar : Enables vCalendar message handling like that produced by Evolution or Outlook, and handles webCal subscriptions. It provides a personal calendar and public calendar import and export. They are integrated with the main download and just need to be loaded from menu Configuration/Plugins in order to be functional. The other plugins have not yet been ported. If you find bugs in Claws Mail, please report them in our Bugzilla, after verifying that it isn't already reported. We would like to thank the GPG4win team for their work on the installer.